Candidate Cain comes to campus.. They had everything they needed to catch students’ attention on World AIDS Day: sweets, balloons, fliers, great music and plenty of freebies. Before the five-hour project was over, nearly 300 students had their test results—and counseling suggestions and information—in hand. 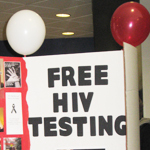 “This is the only class that does a testing event as a project,” said a pleased Misty Ellis, youth education coordinator for the Nashville-based HIV/AIDS education and service organization. “I think everybody expects us to be here now,” added Derrin Mitchell, a psychology graduate student who served as one of the class’s project managers. The class isn’t formally a part of MTSU’s Experiential Learning initiative, which gives students special credit and recognition for classes offering hands-on learning through practical application and public service. Crooks said, however, that her courses always have an EXL component, and she’s considering adding this one to the program. The students have spent the last few weeks working up publicity plans, wrangling logistics and staffing, learning about HIV, signing confidentiality agreements to ensure testing privacy and setting up social-media outlets and a website (http://freehivtest.weebly.com). On the last day of class, each group will submit project summaries and make a presentation on their accomplishments. Click the logo above to visit NashvilleCARES.org. They’ll probably thank MT Lambda, the student organization supporting gay, lesbian, bisexual, transgendered and transsexual people, whose members passed out cupcakes and red ribbons and helpfully directed people to the HIV testing table, and Advocates for Youth, whose candy, cupcakes and condoms helped raise awareness for its “Great American Condom Campaign,” too.